Yes, these are totally two different kinds of situations. If you have downloaded Netflix movies on your computer, there is no need to install Netflix app for iPad, you can simply transfer your movies from your computer to iPad and enjoy them offline. On the contrary, if you are a Netflix member and have installed the official app on your iPad, watching Netflix on iPad directly comes to optimal choice. Let's check the details. See also: watched Netflix on Mac. Supposing you have some Netflix movies you have downloaded on your computer. Make sure your Netflix movies are in iPad compatible formats like MP4, MOV, M4V. If not, you may have to convert the file first. Well, it can be a trifle with the help of MacX Video Converter Pro. Any formats conversion can be achieved at fast speed with this excellent video converter. It also provides the preset for Apple iPad so that you are able to get Netflix movie to iPad conversion straight without bothering on video format, resolution, aspect ratio, etc. Free download the video converter (or Windows version for PCs) and launch it on your computer. Then click "Add Files" button to load your Netflix movies. As you are willing to watch Netflix on iPad, follow Apple Device > to iPad Video, to find your specific iPad. Hit "RUN" button to start conversion. By the way, you are able to view the short converting process and cancel it at anytime. Once you have done that, you can transfer the Netflix movies to iPad via iTunes or iCould and watch the converted Netflix on iPad as you wish. 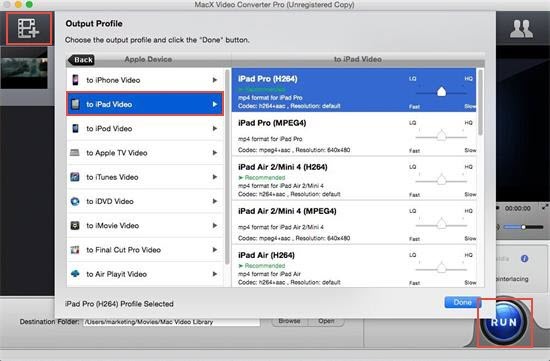 Apart from converting ability, MacX Video Converter Pro is also talented in grabbing Netflix movies by screen recording, or downloading any online videos from YouTube, Facebook, Myspace, or other sites similar to Netflix. Undoubtedly, Netflix iOS app serves as the best solution to watch blockbusters on iPad if there is a good network connection. But Netflix for iPad not working occurs now and then. So if you run into the situation, you can switch to option#1 to watch Netflix movies on iPad offline. Guide you to dig out the best Netflix alternative for your video streaming and rental DVD watching. 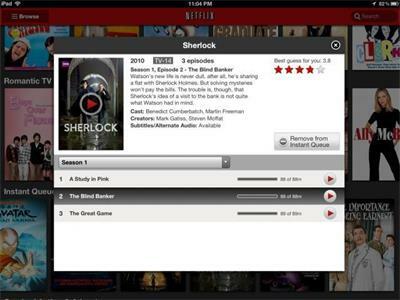 Stay on this Netflix tutorial and you will find the best Netflix alternative to enjoy your multi-media life. Download Netflix video converter to convert Netflix to iPad Pro, iPad Air, iPad Mini series in MP4, H264, MOV, etc. formats with original high quality.